Artists are revitalizing Philadelphia through innovative design. And, at MAAG, we are proud of our members who are making exactly that kind of a difference. Read on as Andy Walker speaks to his upcoming November exhibition @ MAAG with Andy Heisey. And mark your calendars to attend a weekend of workshops, exhibitions, and panels to remember. The urban environment is in desperate need of rejuvenation. Thousands of buildings are left abandoned and are magnets for all sorts of criminal and undesirable activity. If nature were allowed to reclaim the land in the city it would grow into humanity’s refuse and incorporate it into new life. 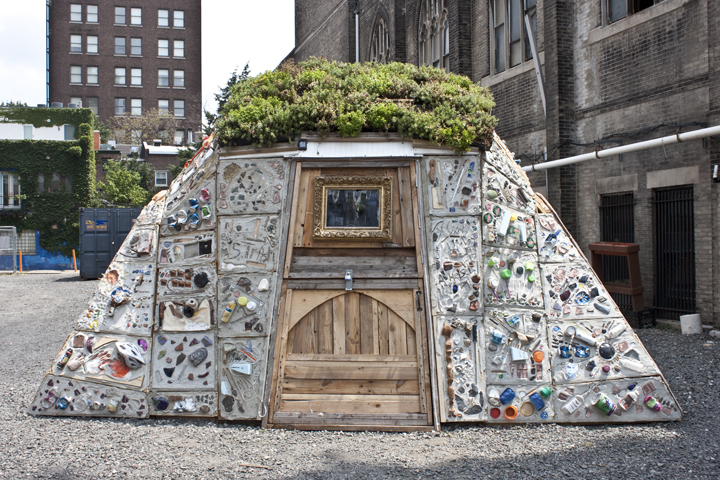 What Andy Walker and Andy Heisey are illustrating in this “Renewed Urban Studio Tent” is recycling the materials found in the city into a new structure that builds on the contaminated urban soil. This is part of an ongoing challenge to future construction to be mindful of the impact building materials have on the environment. Years after a building is torn down and removed the soil is scarred by the structure. If you were to dig down below the city you would find the remains of our culture. In August of 2012, Andy and Andy built RUST and in September RUST 2. 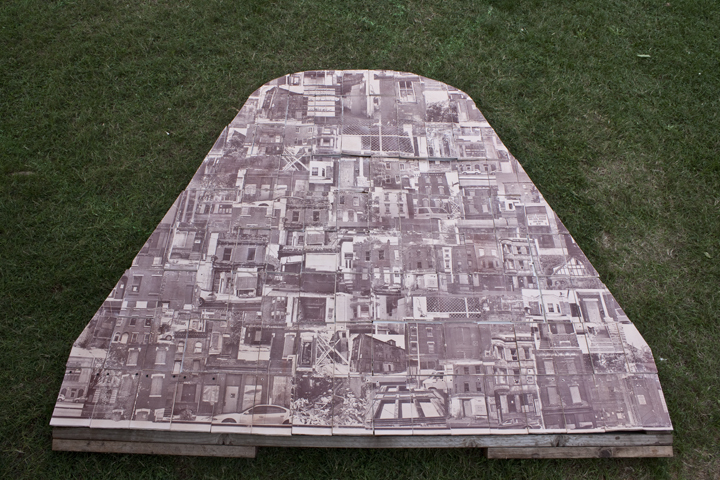 One end of the dome shape building was made of a clay shell with images of abandoned homes from all over Philadelphia. These images were made from iron oxide image transfers onto the clay. The middle of the wigwam was made of recycled materials collected from the streets of the city that was mixed with slag cement (recycled cement). The window arch harnessed the qualities of glass. We collected glass bottles and fused them together to create a wall/window to allow light inside the internal space of our building. RUST was a living studio for artists to work in and also challenge our notion of what urban building can be. The community helped us create the collages and the look of RUST. The brick and glass houses surrounding the structure were a background of past building practices. These structures stood as a contrast to RUST which brought the past into the present by using innovative materials and combining them in creative ways resulting in a sustainable housing unit. RUST 2 was built to show that this structure, which was made from recycled material, would be recycled over and over again. RUST 2 was built across the street from the original version. The skin and the bones were separated and placed on the platforms of the Hamilton Building on Broad Street in Philadelphia. The bones consisted of the arches, living roof, door, clay tiles, and glass windows. 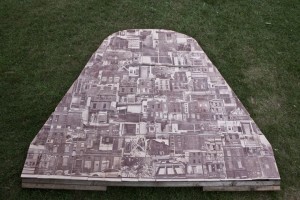 On the other platform we created a three-sided backdrop for the cement collages, which made up the outer skin of RUST. RUST 2 highlighted the structural essence of the project and displayed the beauty that can be created from refuse. The final version of RUST will be created at the Mt. Airy Art Garage. This gallery version of RUST 3 will consist of the basic elements of the original RUST: entrance with living roof and door, a wall display of clay tiles and windows, a projected video of the whole RUST project and other artists’ works that were created inside RUST. The purpose of this final recycling of our project is to show how artists and the community can work together to create beauty out of refuse. The opening will be Saturday, November 10, 6 to 8 pm. This will be followed by a citywide panel, “Artists Taking Back Philadelphia—Brick by Brick” on Sunday, November 11 at 2 pm. This panel will feature Andy Walker/Andy Heisey—RUST, Gary Steuer—Chief Cultural Officer for the City of Philadelphia, and Shari Hersh/Dre Urhahn—Philly Painting (a project of the MuralArts Program). We will address topics of urban renewal, the role of artists in dealing with contemporary problems, and how artists have already made positive changes in our world. We hope this discussion help bring out more artists interested in building our world and assisting in the changes that will be needed for the future. Admission is $10. On that same Sunday, November 11, 10 am, Andy Heisey and Andy Walker will host a workshop which will discuss the different ways you can recycle all different types of materials in your artwork. We will show you how to reuse your old bottles, bottle caps, old CDs and more. You can make great collages by placing these objects into wet recycled cement called slag. 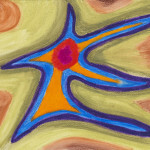 You can also learn how to put images that you create on the computer onto clay tiles. Lastly we will show you how to make windows out of old bottles. You can learn all these fun skills and help save the environment. Donation is $10. 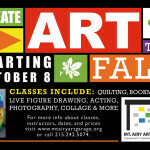 Everything is happening at the Mt Airy Art Garage at 11 West Mt Airy Ave. All these events combine to prove the importance of community involvement in retaking our city and creating beauty out of refuse.